So this is my life right now. The good news is that my things arrived from California and everything is in good shape. The other good news is that the boxes are available for plunder. And plunder I am! The photo is the trunk of my car. That blank space was filled and more stuff crammed on top before I slammed the trunk lid down. No, I’m not calling it a boot yet but I think it’s just a matter of time. France is a major retirement destination for the British. This whole Town and Country thing is really different from California. I lived in a suburb, for one thing, and kept away from true countryside as a matter of policy. So anything comfy, clean and casual was good for most occasions. Here, it’s not that way. 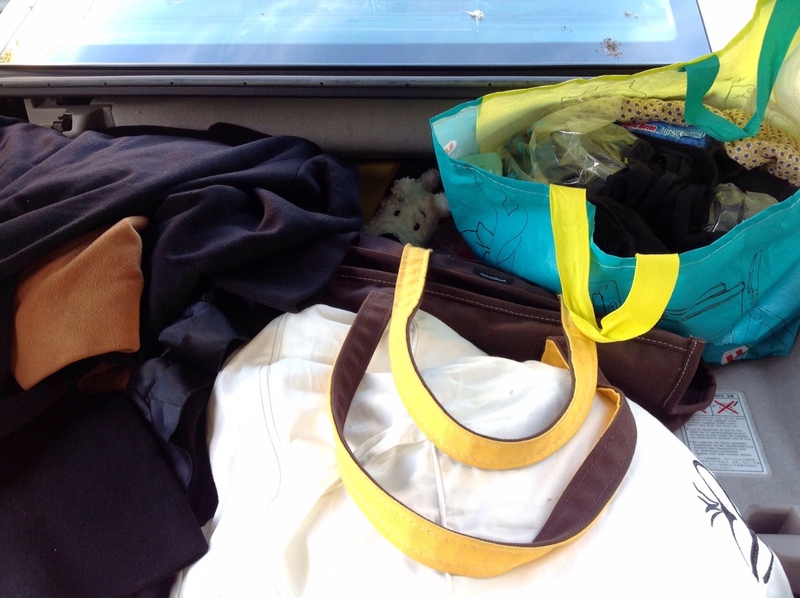 The trunk is basically loaded with clothes that I wouldn’t dream of wearing in the countryside: silk blouses, a cashmere coat, a vicuna coat, nice shoes, you get the idea. No way. The only question is, where in my tiny apartment am I going to put all this stuff. I do need nicer clothing here in Paris. I went to an interesting event this evening, a dinner where Francois Fillon spoke. It was Chanel jacket and Birken bag time, no question, and I guessed wrong, not that I have a Birken bag anyway. My choice, a nice silk blouse and slacks and my everyday purse, would have gotten me through a wedding in California. Here, forget it, not horrible but not close, either. Fillon wanted to talk about his economic proposals, which are basically Sarkozy’s proposals, the ones that look reasonable by American standards but caused massive demonstrations over here. The job and financial situation is not good in France. Good luck to him. I have to be careful sometimes, as my house project is pretty big, by French standards. I find myself inadvertently raising expectations. In the States you consider all the options and collect as many opinions as possible before you make a decision. Here I have to do that more or less by myself. If I drop into a showroom they are sometimes kind of desperate to sell me stuff. My “what-if” comments are too often taken as some kind of plan or promise. I am learning to be very careful what I say and to whom I say it. It’s a big change in how I relate to building projects and to the world. Previous Post Paint samples: comments please?